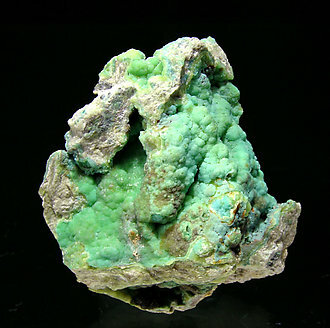 The locality is well known for Variscite but occasionally some samples of Turquoise had been found there. On the specimen are two microcrystalline concretions of Turquoise on a Wavellite matrix of acicular crystals forming radial greenish yellow aggregates. We’ll provide a copy of the analysis to the buyer. 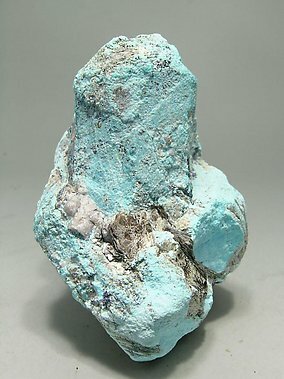 A curious pseudomorph in which Turquoise completely replaces Apatite but clearly preserving the shape and the forms of the prism and the pyramid of the pre-existing Apatite crystal. The phosphate deposit of Palazuelo de las Cuevas (Zamora, Spain) is well known for the presence of Variscite. This mineral was mined by Prehistoric man. Variscite occasionally is accompanied by Turquoise, Wavellite and other phosphates. 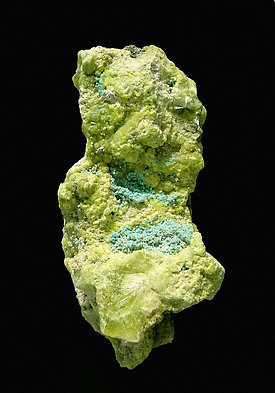 In this specimen the coating of Turquoise, as small globular and leafy microcrystal blue greenish aggregates, contrasts with the botryoidal Wavellite. We’ll provide a copy of the analysis to the buyer.